Named for its pastoral location, the ensemble is a medieval masterpiece. Yaroslavl. Korovniki ensemble: Church of St. John Chrysostome (left), Church of the Vladimir Icon. Northwest view. July 24, 1997. 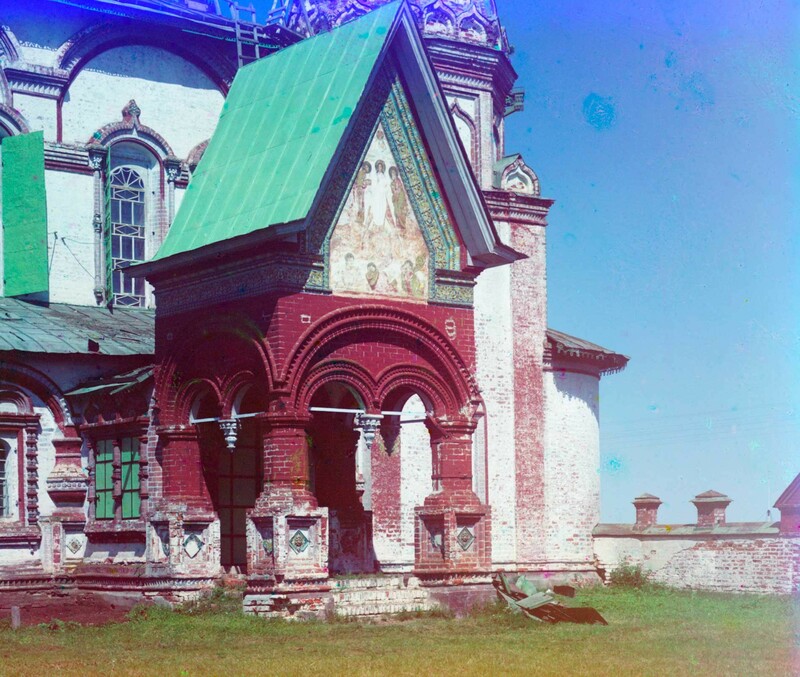 At the beginning of the 20th century, the Russian chemist and photographer Sergei Prokudin-Gorsky devised a complex process for vivid, detailed color photography. 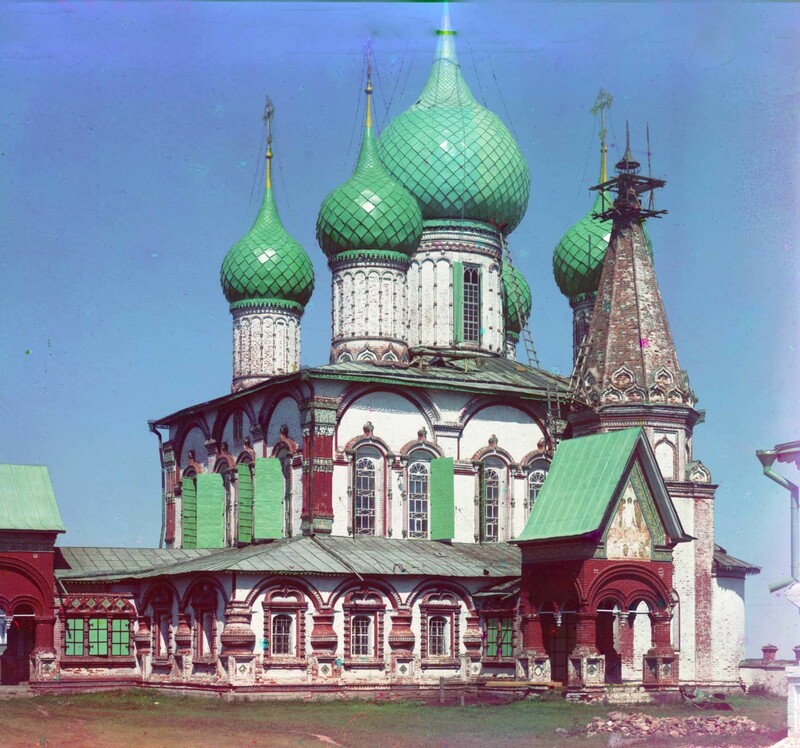 His vision of photography as a form of education and enlightenment was demonstrated with special clarity through his photographs of architectural monuments in historic sites throughout the Russian heartland. Support for his project came from the Ministry of Transportation, which facilitated his photography along Russia’s rail network and waterways. His trips along the Volga River proved especially productive. One of the richest historic towns on the river is Yaroslavl, about 150 miles northeast of Moscow. 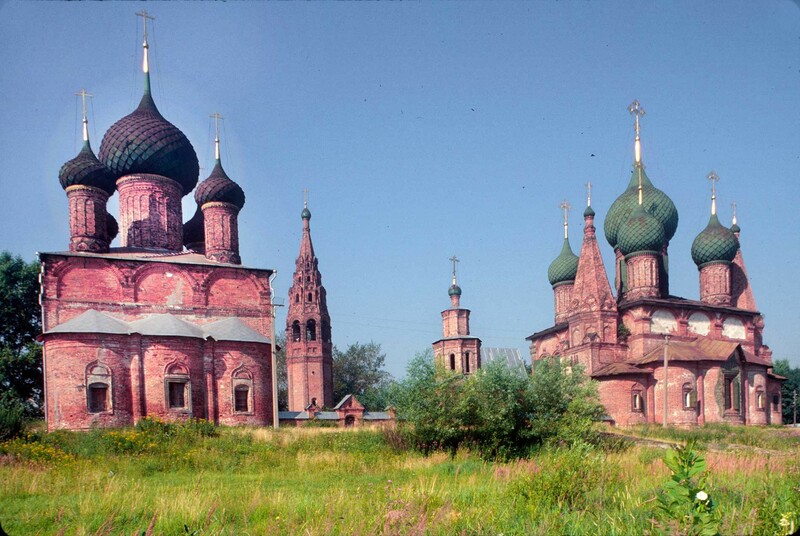 Korovniki ensemble: Church of St. John Chrysostome (left), Holy Gate, bell tower, Church of the Vladimir Icon. Northwest view. Background: Volga River. Mottled appearance of clouds caused by motion during three exposure color process. Summer 1911. 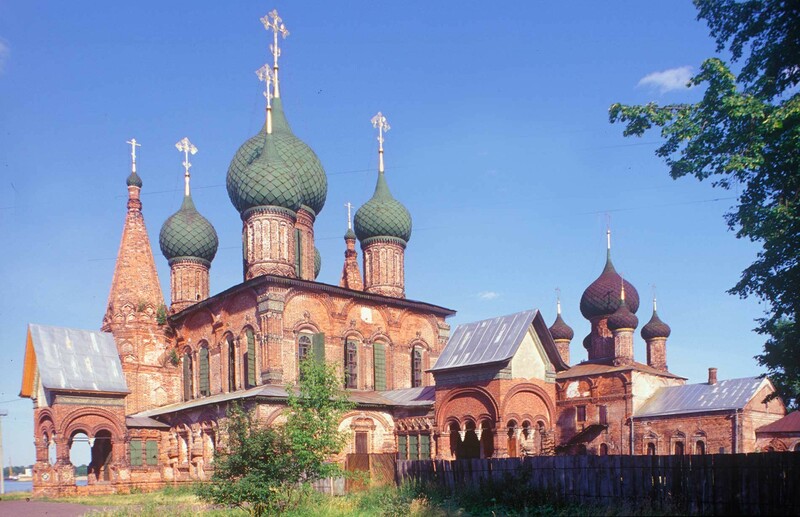 Although it is now an industrial center of some 650,000 residents, Yaroslavl has a remarkable concentration of church art and architecture from the 16th through the 19th centuries. Prokudin-Gorsky photographed there in the summers of 1910 and 1911. My work in Yaroslavl extends three decades, from 1987 to 2017. We were both captivated by the Church of St. John Chrysostom, whose master builders created a structure renowned for its polychrome ceramic work and magnificent crown of cupolas. Church of St. John Chrysostome. Northwest view. July 24, 1997. 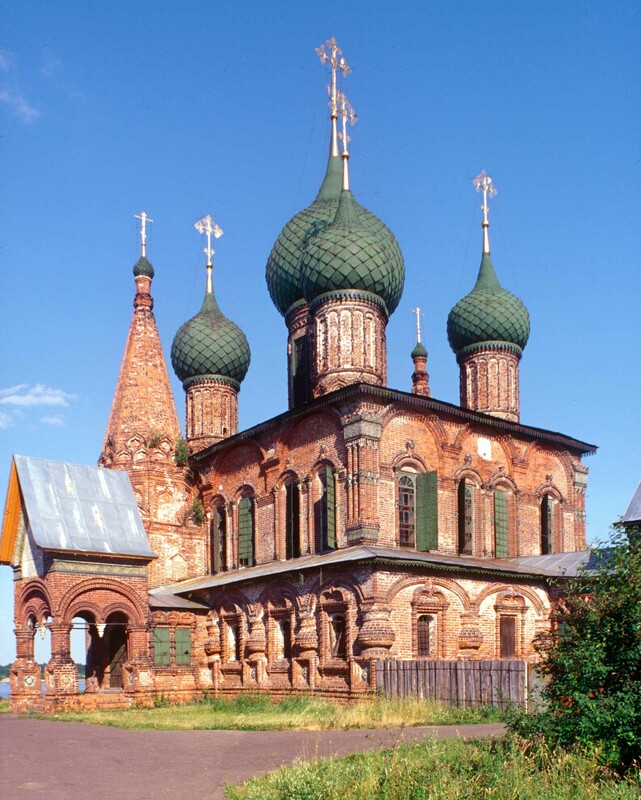 Founded in the early 11th century by Yaroslav the Wise — one of the great rulers of medieval Rus — Yaroslavl in the early 13th century already had masonry churches, unusual in a time when most buildings were of logs. In 1238, the town was sacked by the Mongols during their conquest of central Russia. Although recovery from Mongol dominance was slow, union with Muscovy in the 15th century integrated the town into a large political and economic structure. Church of St. John Chrysostome. Southwest view. Summer 1911. Yaroslavl benefited as a center for trade not only within the extensive Volga River basin but also with the Russian North, which served as an outlet via the White Sea to commerce with western Europe. From this position, Yaroslavl’s mercantile network stretched from the White Sea into Siberia. With such commercial possibilities, Yaroslavl attracted Russian and foreign merchants — English, Dutch, and German. Only Moscow could rival Yaroslavl in its concentration of new churches, sponsored by a combination of wealthy entrepreneurs, city districts, and trade associations. During the 17th century, the area’s 35 parishes witnessed the construction of 44 masonry churches, most of which were erected after a fire that swept through the town in 1658. Church of St. John Chrysostome. Southwest view. August 15, 2017. 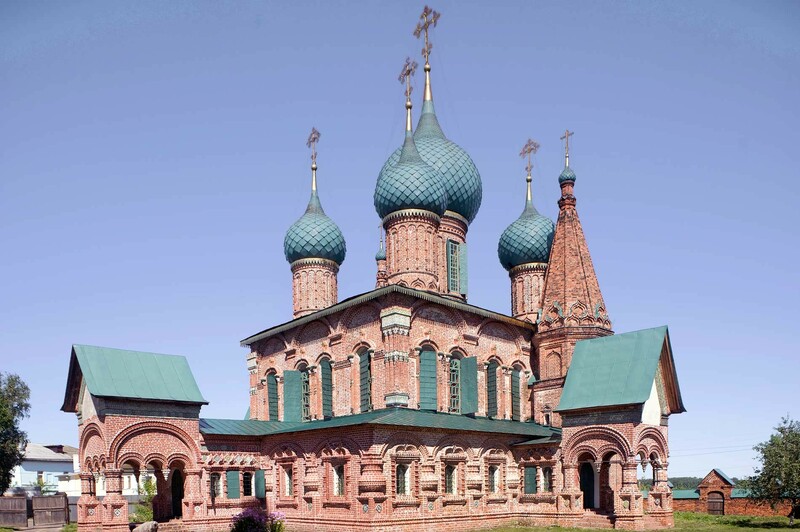 The skill of Yaroslavl's builders in forming church ensembles was most impressively demonstrated at Korovniki, a district on the city outskirts near the confluence of the small Kotorosl River with the Volga. The area takes its name from the Russian word korova (cow) and was used as pasturage. Locals also engaged in ceramic crafts, brick-making, and pottery, all of which play a major role in the structure and decoration of this ensemble of two churches, with a large bell tower situated between them on the west. Prokudin-Gorsky’s several photographs of the ensemble are among his best work. Church of St. John Chrysostome. South facade & porch with ceramic border & fresco of Transfiguration. Summer 1911. The main structure of the Korovniki ensemble is the Church of St. John Chrysostom, commissioned by the merchants Ivan and Fyodor Nezhdanov, who are buried in its south gallery. Constructed in 1649-1654, the church was remodeled with more elaborate decoration in the 1680s and thus represents an amalgam of two periods. 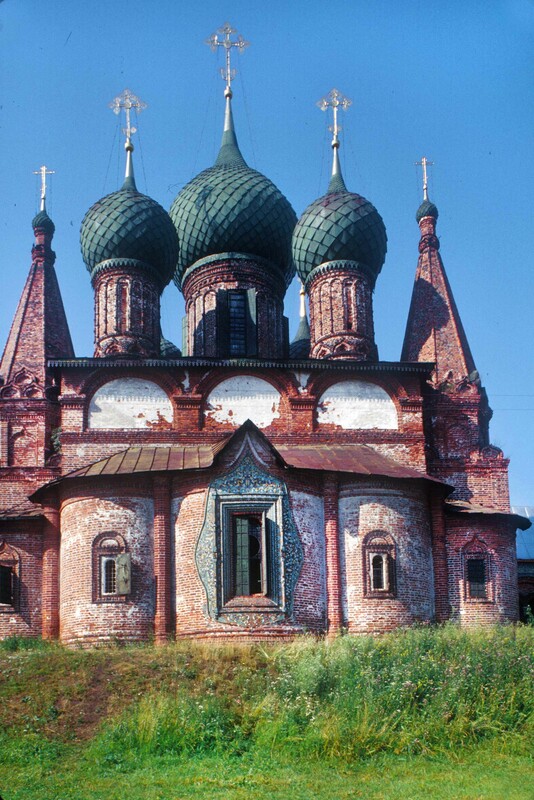 The sum of the parts rivals the Church of John the Baptist at Tolchkovo in its superbly calculated balance of forms. The symmetry begins at the first level of the church, flanked by galleries on the north, west, and south facades. In the 1680s, a decorative porch with a steep roof was constructed to the entrance to each gallery. At their east end the enclosed galleries lead to chapels dedicated to the Conception of John the Baptist (on the north) and Grand Princess St. Olga on the south. The chapel apses on the east merge into a five-part apsidal structure decorated with ceramic tiles. The tower roofs above the chapels create vertical accents at the east corners of the church. 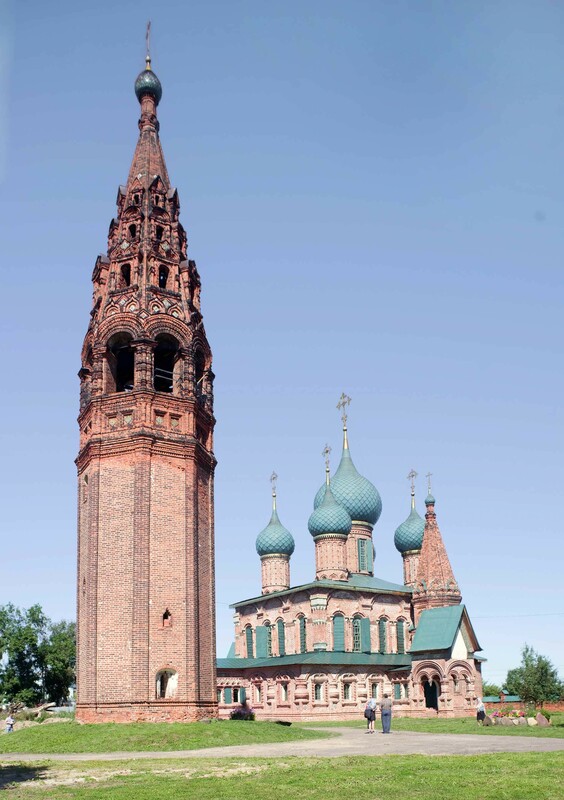 Korovniki ensemble: Church of the Vladimir Icon (left), bell tower, Holy Gate, Church of St. John Chrysostome. East view from Volga embankment. July 27, 1997. When seen from either the west or east, all the components, including the porches and the chapel towers, create a pyramidal ascent culminating in an ensemble of cylindrical drums and cupolas. The height of the crown above the roof exceeds that of the basic structure. This soaring effect was repeated in other Yaroslavl churches and would become a signature Yaroslavl style. A comparison of my photographs with Prokudin-Gorsky’s shows that most of these elements have been preserved. 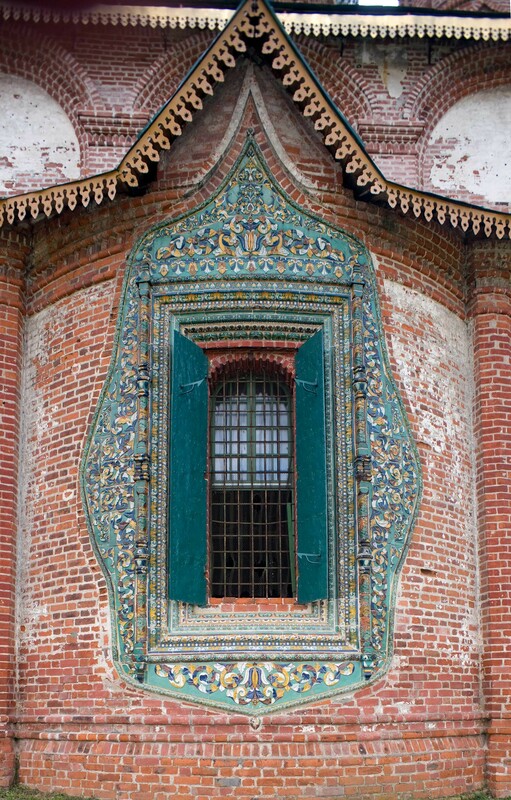 The Korovniki monument is an excellent example of the intricate use of polychrome ceramic ornament that symbolized the community’s wealth and artistry. Although Prokudin-Gorsky apparently did not photograph the east façade, it is especially notable for the central ceramic window surround, whose size enables it to be seen from the Volga — the best vantage for the ensemble in its entirety. 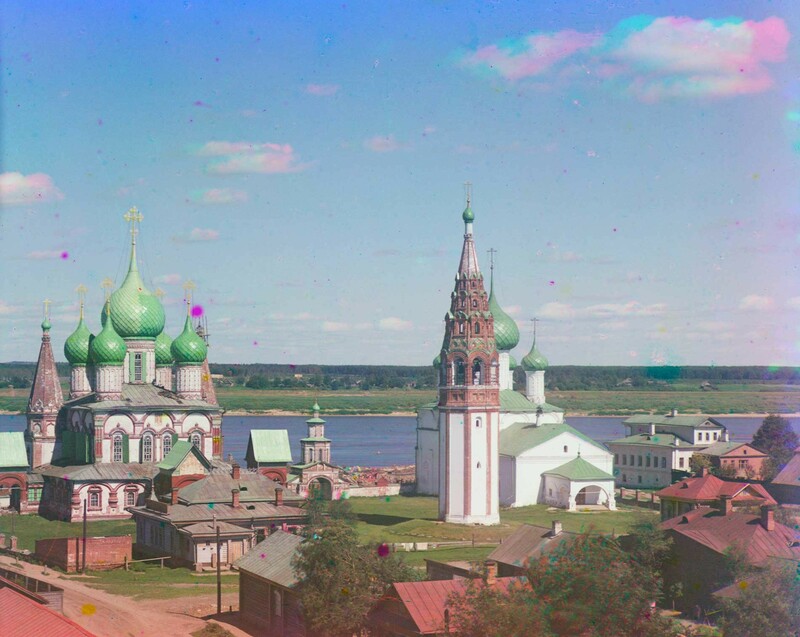 The primary way of reaching the Korovniki churches was from the Volga, and builders over the decades endowed the east side with a festive appearance. Church of St. John Chrysostome with flanking chapels (under towers). East view. July 27, 1997. The basic plan of the St. John Church derives from the traditional four interior piers that support the main cupola, elevated on its cylindrical drum. The four lower cupolas on the diagonals are decorative; without windows, they are “blind” and do not admit light. The cornice beneath the roof is divided into three semicircular gables (zakomary). It has been suggested that the original roof line followed the curved zakomary contours in the manner of earlier medieval practice. If so, it was one of the last examples of such a practice. Other 17th-century Yaroslavl churches had flat roofs above decorative cornices. Church of St. John Chrysostome, central apse with ceramic window surround. August 14, 2017. The second church of the Korovniki ensemble was completed in 1669 and dedicated to the Icon of the Vladimir Mother of God. More modest than the Chrysostom Church, it provides an important visual balance to the ensemble, particularly from the east. Intended for winter services, the church had a vaulted ceiling between the first and second stories to preserve heat. Between the two churches is the octagonal bell tower, constructed in the 1670s and capped by a tall spire with three tiers of framed openings for sound. Because of its great height (37 meters) and slender form, it was known as the “Yaroslavl Candle”. Its large complement of bells came from Demidov factories beyond the Urals. Korovniki ensemble, Holy Gate. West view. August 15, 2017. 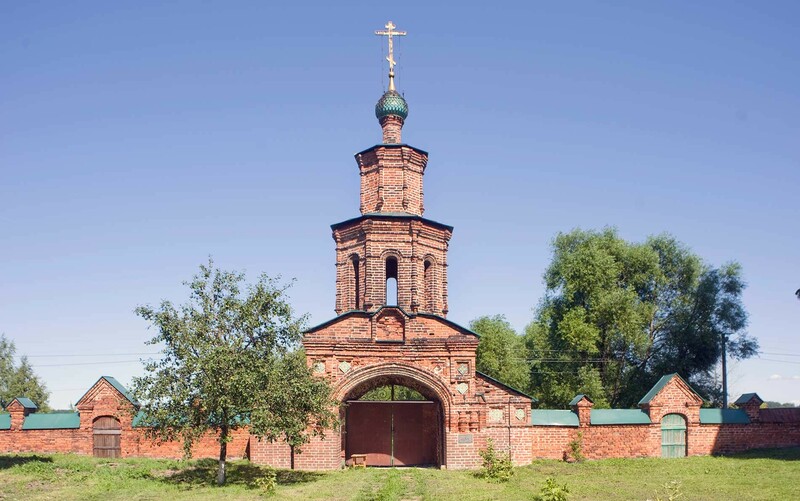 The ensemble’s east boundary, overlooking the Volga, is delineated by a brick wall and a Holy Gate supporting two octagonal tiers and a small cupola. The gate itself is an important part of the ensemble’s ornament and provided a festive entrance from the Volga River landing. Recently, the Korovniki ensemble was given by city authorities to the local Old Believer Orthodox community. Their worship services are conducted in the Church of the Vladimir Icon, while restoration work continues at the St. John Church, a national monument. Access to the latter church can be arranged by agreement with the priest. Korovniki ensemble. Bell tower with Church of St. John Chrysostome. Southwest view. August 15, 2017.